The New York Times ran a story today about Robyn O’Brien, a mother of three in Colorado, who recently began a crusade to educate people on what she believes to be the link between food additives and the perceived increase in childhood allergies. Basically, Robyn O’Brien believes that all of our medical woos can be blamed on the herbicides, artificial additives, and Frankenstein food being pushed onto the American public by giant, evil, profit-driven corporations. Subsequent comments go on to blame MSG for everything from migraine headaches to global warming and impotence (not really but I wouldn’t be surprised if someone had). Really? Are people serious? Are folks still obsessing about the supposed adverse affects of MSG? Hasn’t it already been established that the vast majority of people with MSG “allergies” are simply racists who use it as a guise to be mean and ignorant while still appearing inclusive? Monosodium glutamate is nothing more than a sodium salt of glutamic acid. Basically an amino acid. It is considered a flavor enhancer because it stimulates certain taste buds…particularly the ones that pick up the umami flavor. It was isolated in 1907 by the Japanese. Although much of the MSG sold today is artificially manufactured, MSG is found naturally in the human body and also certain foods such as mushrooms, seaweed, tomatoes, nuts, legumes, certain cheeses, and meats. There is more MSG found in Roquefort and Parmesan Cheese, Marmite, and Vegemite than soy sauce. There has only been one medical study that has been able to show a negative reaction to MSG…in mice. A 1995 review by the FDA (if you can trust them) affirmed the safety of it. 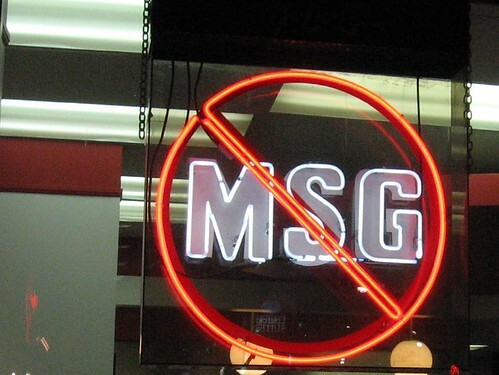 Nearly all the negative associations about MSG (and the subsequent Chinese Resturant Syndrome) is anecdotal. I just wish all those people who are afraid of MSG, SARS, the bird flu and lead contaminated toys from China would just come out and admit that they hate us. It’s okay. I’ve got tough skin. It would make finding the good people a lot easier.